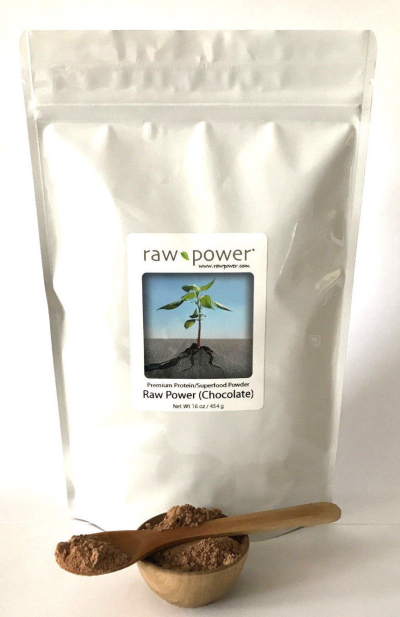 Item #0003: We bring you a CHOCOLATE (cacao) version of our popular protein superfood blend Raw Power (Original) (Item #0002). "Our Raw Power Protein Superfood Blend was born out of our wishing such a product existed for our own use. We would talk about how it would be great if there were a 100% organic, 100% raw, 100% vegan, 100% HEALTHY protein powder out there -- with no fillers and no average ingredients -- strictly the best ingredients planet Earth has to offer. After a few years of trying dozens of different ingredient blends, we finally got it just perfect, and here it is, for everyone to enjoy. And we mean everyone: men, women, children, young, old, active, less-active, athlete, vegan, vegetarian, whole-food-eater, etc. The beauty of our product is that it is clean, usable nutrition for every body. Raw Power! Protein is for everyone who wants to add premium-quality, vegetarian protein and/or super nutrition to their diet. Raw Power! is not just a protein powder, it's a Superfood Blend. In fact, we weren't sure if we should market it as a protein powder or Superfood Blend since it's really both. But we realize that a lot of people out there need and want more clean, high-quality protein in their diets, and that's what they look for. 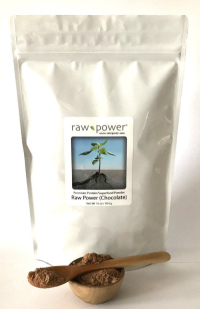 The ingredients in Raw Power Chocolate Protein Superfood Blend have been carefully selected and formulated to bring you a natural, balanced, nutrient-rich protein product. Cacao Powder (made from 100% raw, organic cacao beans) is one of the world's most antioxidant-rich superfoods and comes to you in a high quality, alkali-free, raw form. Cacao has been valued for its nutritional properties for thousands of years. All real chocolate is made from (and gets its chocolate-taste from) cacao beans. Ingredients: Hemp protein powder (seed), Brazil nut protein powder, Maca powder (root), Goji berry powder (lycium fruit), Cacao powder (bean), Mesquite powder (pod). All ingredients are raw, vegan and organic. Click here to view smoothie recipes using Raw Power Protein Superfood Blends.